At Top Quality Online Solutions, Inc. we believe our unique approach to all website development, search engine optimization, graphic design, web design and web hosting projects is what sets us apart from the competition. We believe that every client deserves the personal attention that leads to successful results. Below you can discover a little bit more about how we approach our projects and how it benefits you. We focus on your goals, learn about your business and provide customized solutions tailored to generating results. There really is nothing more exciting to us than learning everything about your business. We believe that knowledge is power and that knowledge ultimately leads to increased revenue for your business. So tell us about your business, about your customers, and about where you see your company in the next 5 years. When you partner with Top Quality Online Solutions, your goals are within reach. Once we have learned as much about your business as possible it’s time to start the real work. Our web development team and marketing specialists will identify your target and design a website with content, functionality, and aesthetics that appeal to that target. In the planning phase we are big on communication. Our team will develop a concept, and once we have approval, we will move forward. 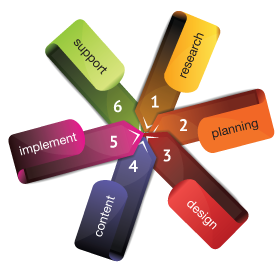 Our web design experts live for this phase of our approach process. During the design phase, our team of talented graphic designers and web developers begin the work of creating the functionality as well as aesthetics of your new website. The end result will present your brand in a professional and visually stunning way. Unlike our competitors, we believe in creating content for your website that your visitors will actually want to read. Our expertly crafted content is developed from in-depth keyword research that allows search engines to find your site online. Not only that, your website copy will present your company in a professional manner with an effective call to action. Every website designed by Top Quality Online Solutions, Inc. is designed to work on all popular web browsers as well as mobile devices. We also institute on-site search engine optimization within the code as well as install Google Analytics. Nothing is left to chance and the performance of your new website can be tracked, analyzed, an studied. Once your website has been published, the real partnership between our company and your business begins. We are always available to provide the assistance, support, and advice that lead to profitability.